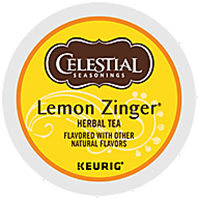 The tart and tangy taste of 100% natural Lemon Zinger delivers a bolt of invigorating flavor to liven up your day. Dried whole lemons blended with hibiscus, rosehips, and lemon grass create a zippy sensation and deliver that unmistakable zinger to your taste buds. This herbal tea is naturally caffeine free.